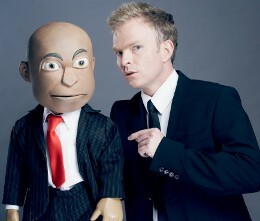 Using post-modern puppets that include the notorious political analyst, Chester Missing, this highly acclaimed extravaganza of world class comedy and cool puppetry effects runs for a season at the Baxter Golden Arrow Studio from 10 to 28 January 2012. Set in a special �loony bin�, Conrad has one last chance to get his crazy puppets released but only if he can get them to behave in front of a test audience. The problem is that his main puppet, Chester Missing of LNN fame, who is also Conrad�s outspoken BEE business partner, no longer wants to be a ventriloquists� puppet; his ambition instead is to go solo and host his own TV talk show. Hilary, the ostrich, who despises playing second fiddle to Chester, is a �has-been� alcoholic show-girl, desperate to make her own star come-back, and Ronnie, the cute but savage green monster, cannot control his impulses in front of people despite Conrad�s best efforts to teach him manners and curb his behaviour. The result is a spectacular and hilarious journey of verbal insanity that pushes the boundaries of ventriloquism and comedy. Conrad Koch is one of South Africa�s most �in demand� comedy talents and winner of the Speakers Inc Entertainer of the Year Award for 2010. He combines hilarious comedy with world class puppetry and has done so for over fifteen years to local and international acclaim. He has been featured on television throughout the world and is a frequent guest at some of South Africa�s biggest comedy events: The Smirnoff Comedy Festival, the Vodacom Comedy Festival, King Size Comedy, The 94,7 Heavyweight Comedy Jam, Blacks Only, SA London Comedy Festival, 46664 It�s no Joke and more. Performances are Tuesdays to Saturdays at 8:15pm from 10- 28 January 2012 at the Baxter Golden Arrow Studio. Tickets on Tuesdays cost R50, Wednesday and Thursday R80, Friday and Saturday R90. Book through Computicket, Shoprite and Checkers outlets, call 0861 915 8000, on line www.computicket.com or at the Baxter 021 685 7880. Discounts are available for Students, senior citizens and block bookings of 10 or more R60 (Wednesday and Thursday), R70 (Friday and Saturday).